The NSG Group has launched a competition aimed at existing and potential customers to celebrate the first birthday of Pilkington K Glass™ S in the UK & Ireland. With over a million square metres of Pilkington K Glass™ S already sold to date, it is fast becoming one of the most popular high performance glass products on the market. 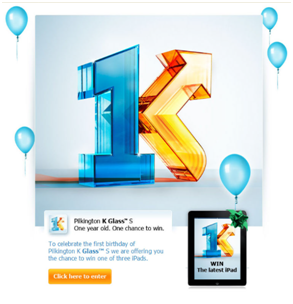 To mark the first birthday of Pilkington K Glass™ S, the NSG Group is giving individuals working in the glass trade the chance to win one of three of the latest Apple iPads. The anniversary is not the only bit of good news for the UK market. Production of Pilkington K Glass™ S is shifting to the newly-opened coating facility at Cowley Hill, St Helens, whereas previously it had to be shipped in from Germany and Sweden. Pilkington K Glass™ S is a high performance, low-emissivity, soft coated product designed to be used as part of an Insulating Glass Unit (IGU). It combines excellent thermal insulation properties with high light transmission and solar heat gain, making it the ideal glass range for the UK’s temperate climate. This is reflected in its A-grade Window Energy Rating (WER). To be in with a chance of winning one of the iPads, click here. The closing date for the competition is Sunday 9th December and the draw will take place on Wednesday 12th December.